Model AVN-1-C operates from 50 MHz to 250 MHz, generating amplitudes of up to 5V with pulse widths variable from 0.2 to 1 ns. The rise and fall times are 100 ps. On all models, the output amplitude is adjustable using a front panel one-turn control. The output pulse width is adjusted using two one-turn controls that control the position of the leading and falling edges of the output pulse, respectively. 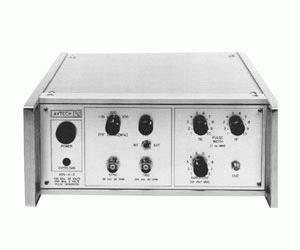 The amplitude, pulse width, and frequency controls on all models interact. For some demanding applications, the user may wish to rely on external attenuators to control the amplitude to minimize such interactions. In some cases, the specifications can be adapted to satisfy a particular requirement.